With this perfect stencils kit you will easily make your own tattoo at home! The kit includes 6 different styles of tattoos reusable stencils. All of our kits comes with our No.1 Fresh Jagua Organic Stencil Solution 1 oz. - A creamy lotion to easily transfer real, Jagua or Henna tattoo stencil's outline. This solution will also help to protect against wiping and smudging during a tattoo job. A Vegan-Friendly product with certified organic ingredients. *Clean the area to which the tattoo is to be applied. *Cut the design you like from the stencil paper. *Spray the stencil solution on the desired area - make sure to SPRAY ONLY A SMALL AMOUNT and then rub it with your hands so it will be spread evenly onto the skin. *Lay the cut stencil on the desired area ink side down. Apply even pressure, while being careful not to move the stencil. The paper should lightly adhere to the damp skin. 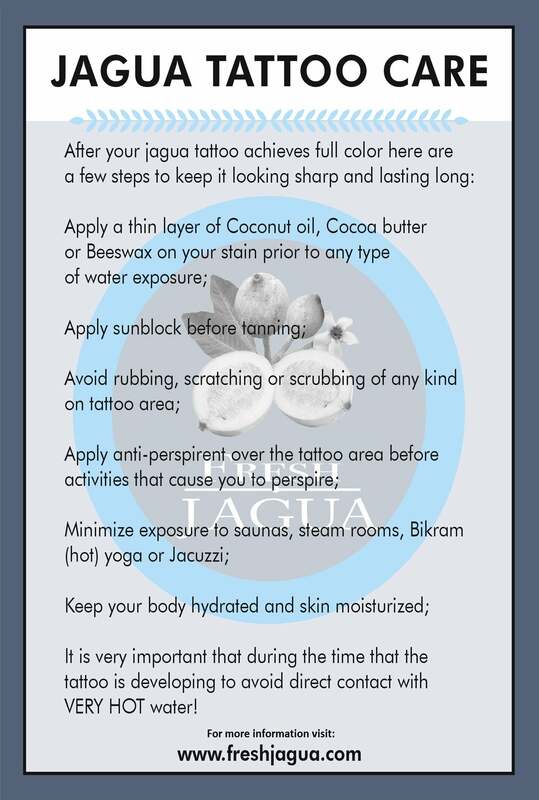 JAGUA LOOKS EXACTLY LIKE A REAL TATTOO!!! last up to one month!